Have you ever wanted a game so bad that you decided that you were okay with sitting through a language you didn't fully understand? Chances are you have if you're reading this article. It's a perfectly acceptable train of thought - localisation takes time for a majority of Japanese games, which can leave fans waiting for months or even years for some releases to hit their side of the world. It's frustrating, which is why importing can be an attractive option to some players, especially fans of genres such JRPGs and Japanese games. Thanks to the language barrier, import games can be a daunting experience for some. After going through the trouble to find out if your foreign game of choice will work on your console or not, you also need to be able to worry about playing and understanding the game. Speaking from a JRPG and Japanese game perspective, if Japanese isn't your first language or you haven't been studying it for a long time, this is obviously difficult. Some people become motivated to learn entire languages for this purpose, while others just want to play the damn game. While there isn't a simple solution to getting past the language barrier in imported games (other than just waiting for the localisation or taking hours and hours to learn a new language), there are helpful apps to at least pull the text from the game and get a digital translation or other methods to help general understanding. While these methods aren't perfect, I use some of these to try learn new Japanese words and to make things a little easier during the tougher parts of playing import games and am sharing them in the hopes of helping others on their import game journey. Note: I own an iPhone, so the apps mentioned here are mostly for iPhone. However, these apps may be available for Android. I may update this article to reflect this soon, but for now, please be aware when reading! Problem: I want to use Google Translate or something, but I can't type in Japanese + typing Japanese I've only just seen for the first time is time consuming and pretty difficult. Solution: A photo translation app, like 'Translate Photo'. For a long time, my biggest problem with playing import games was even if I wanted to use a translation site, typing in the Japanese was way too time consuming, which is not good if you only have a limited amount of game time every week. I remembered someone mentioning using a photo translation app to translate signs while traveling and I figured there should be an app like this for Japanese. Luckily in our lovely modern age of cool apps, there was. I tried a free trial version for an app called 'Translate Photo' (the paid version has a red icon and the trial has a blue icon) and quickly ended up buying the full version. Translate Photo allows you to take a photo of anything or use a photo saved on your phone and as long as the photo is clear, it can usually accurately pull the text from the image into a copy and paste-able form. Using this app, you can take a photo of the screen (or send a screenshot to your phone, but that takes longer) and select the text you want to translate, crop and edit the image (which can be helpful if the text is a different colour or smaller) and let the app do the rest. This version of the text allows you to either look up the words in the dictionary, use the in app translator (which seems to work like Google Translate) or copy it into another translator to get something that's at least close to the meaning. Problem: Translated text is kinda weird. Is there anyway I can get a more natural translation? Solution: A Japanese dictionary that can give definitions for a bunch of typed text or copied text, such as 'Imiwa'. If you can't find a fan translation, but the digital translation isn't perfect (which is likely), you can try working out the meaning from the context of the words, using a Japanese dictionary. I highly recommend the free Imiwa app for iPhone - it can detect words from a bunch of text, meaning you can just read the definitions and go from there. An added bonus for Japanese learners is you can favourite the words you don't know so you can add them to your vocabulary. It's so great, I don't understand why it's free. Using Imiwa and looking up the words is my preferred method when playing games, even if it involves a little more brain work. Other than wanting to learn Japanese, I find once I scroll through the words, I can make sense of the text in a way it makes sense to me rather than becoming confused by a digital translation. However, while less natural sounding, a digital translation is the easier of the two methods as it tries to also translate grammar. Note: Apparently JSho is a good alternative for Andriod users! Problem: Working out the story is good and all, but working out the mechanics of the game is hard without instructions. Especially if your game is one that is a few years old, there's a surprising number of walkthroughs available for Japanese games. A simple Google search of the game you want to buy/already own will show this. This is especially good if you're considering buying an import game - you can gauge how easy the game will be to play just by using walkthroughs and Youtube 'Let's Play' videos. 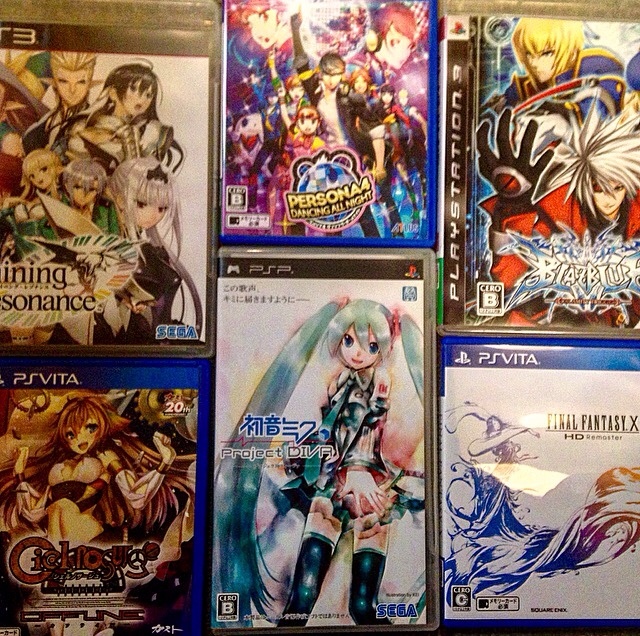 Once I accepted the fact I wouldn't understand everything, Japanese games became instantly more fun. If you're trying to learn Japanese or you're a JRPG story junkie (I'm both), it can be tempting to pick apart every line, every word and every grammar point. However, this just isn't realistic if you actually want to play a game, not study I game. I found this gave me way too much 'stop and start' to actually enjoy the game and it took quite a long time just to get through initial cutscenes. Nowadays, I try to only look up the sentences that really stump me or that seem important to understanding the plot. You can pick up a lot from context and cutscenes and thankfully the great button mashing method can help one learn the mechanics of a game. I think it's good to use a combination of all of these methods, but remembering that unless you're a native Japanese speaker or a master of the language, understanding everything probably isn't realistic. It's a game you probably picked because it looked fun, so just have fun! None of these tips are perfect or a one size fits all method and this certainly isn't a comprehensive list as I'm only just finding my feet in the unlocalised game world myself. I hope this helps you guys get through your imported games, let me know what you're playing or recommend playing in the comments below! You can buy import games online at sites such as Play-Asia.com. Note: This article does contain an affiliate links to Play-Asia to help support this site. You can read our Affiliate Link Policy here.